De la Garza’s efforts to protect the agriculture industry extended to the debates on immigration reform that took place in the 1980s. An initial immigration reform package faltered in 1983, largely because of the Hispanic Caucus’s influence. When the Immigration Control and Legalization Amendments Act of 1986 (H.R. 3810) was brought to the House Floor, de la Garza sponsored an amendment to prohibit immigration officials from entering agricultural operations without a search warrant or the owner’s consent.33 “[Fourth Amendment] constitutional protections are applicable to persons conducting businesses in office buildings and it is not apparent why persons conducting businesses in fields are less deserving of this basic constitutional benefit,” de la Garza said when he introduced his amendment. “This amendment is particularly important … because it will ensure that farming operations will not be disrupted by broad scale, random raids. Work stoppages are very costly to the farmer, especially when the crops need harvesting in a timely manner.”34 The amendment was adopted by a 221 to 170 vote.35 De la Garza voted against the final bill, however. 1Carmen Enciso and Tracy North, eds., Hispanic Americans in Congress, 1822–1995 (Washington, D.C.: Government Printing Office, 1996): 30. Representative Antonio M. Fernández chaired the Committee on Memorials in the 79th Congress (1945–1947). 2Ward Sinclair, “That Fresh Breeze Blowing through Congress Is Named Kika,” 27 December 1983, Washington Post: A7. 3Matt Meier, Mexican American Biographies (New York: Greenwood Press, 1988): 87; Enciso and North, Hispanic Americans in Congress: 29–30; interview with Eligio (Kika) de la Garza by Oscar J. Martinez, 1975, “Interview no. 208,” Institute of Oral History, University of Texas—El Paso: 1, 14. 4Ben Guttery, Representing Texas: A Comprehensive History of U.S. and Confederate Senators and Representatives from Texas (n.p., 2008): 54. 5Ralph Nader Congress Project, Citizens Look at Congress: Eligio de la Garza, Democratic Representative from Texas (Washington, D.C.: Grossman Publishers, 1972); interview with Eligio (Kika) de la Garza by Oscar J. Martinez, 1975, “Interview no. 208,” Institute of Oral History, University of Texas–El Paso. 6For more information on de la Garza’s activities in the Texas house, see Legislative Reference Library of Texas, “Eligio de la Garza,” http://www.lrl.state.tx.us/legeLeaders/index.cfm (accessed 11 April 2011); Ralph Nader Congress Project, Eligio de la Garza. 7Enciso and North, Hispanic Americans in Congress, 1822–1995: 30. 8Ralph Nader Congress Project, Eligio de la Garza. 9Almanac of American Politics, 1972 (Washington, D.C.: National Journal, Inc., 1971): 806; Almanac of American Politics, 1974 (Washington, D.C.: National Journal, Inc., 1973): 995–996. For more information on the composition of Representative de la Garza’s district, see David Montejano, Anglos and Mexicans: In the Making of Texas, 1836–1986 (Austin: University of Texas Press, 1987): 79–82. 10Robert E. Ford, “Texas Holds Runoff Today on Nominees,” 6 June 1964, Washington Post: A6; “Texas Voters Decide Runoff Choices Today,” 6 June 1964, Los Angeles Times: 6; “Election Statistics, 1920 to Present,” http://history.house.gov/Institution/Election-Statistics/Election-Statistics/. 11“Election Statistics, 1920 to Present,” http://history.house.gov/Institution/Election-Statistics/Election-Statistics/. 12Garrison Nelson, Committees in the U.S. Congress, 1993–2010 (Washington, D.C.: CQ Press, 2011): 669. 13Congressional Record, House, 89th Cong., 2nd sess. (1 September 1966): 21658. 14Hearing before the House Committee on Agriculture, Agricultural Legislation in the 90th Congress, 90th Cong., 2nd sess. (9 November 1968): iv; Congressional Directory, 92nd–96th Congresses (Washington, D.C.: Government Printing Office). The name of this subcommittee varied during this period, as follows: Departmental Operations (90th–91st Congresses), Department Operations (92nd–93rd Congresses), Department Operations, Investigations and Oversight (94th Congress), and Department Investigations, Oversight, and Research (95th–96th Congresses). 15Congressional Record, House, 92nd Cong., 1st sess. (4 October 1971): 34807–34809; Congressional Record, House, 95th Cong., 2nd sess. (12 April 1978): 9909; Congressional Record, House, 92nd Cong., 1st sess. (4 May 1978): 12613. 16Congressional Record, House, 95th Cong., 1st sess. (22 July 1977): 24560. 18Dan Carney, “Untitled,” 21 September 1989, States News Service. 19Interview with Eligio (Kika) de la Garza by Oscar J. Martinez, 1975, “Interview no. 208,” Institute of Oral History, University of Texas—El Paso. 20Thomas J. Foley, “‘Brown Power’ Parley Opens This Weekend,” 22 October 1971, Los Angeles Times: A18. 21Congressional Record, House, 89th Cong., 1st sess. (9 July 1965): 16285; Congressional Record, House, 91st Cong., 2nd sess. (17 June 1970): 20199; Congressional Record, House, 94th Cong., 1st sess. (4 June 1975): 16917; Congressional Record, House, 90th Cong., 1st sess. (15 December 1967): 37174; Congressional Record, House, 100th Cong., 2nd sess. (22 March 1988): 4791. 23Whitney L. Jackson, “Out of Office, Still a Public Servant,” 31 May 2001, Roll Call: 22. 25Seth King, “No One Seems Satisfied with the New Farm Bill,” 19 December 1981, New York Times: 16. 26Ward Sinclair, “House, over White House Objections, Votes Expensive Four Year Farm Bill,” 23 October 1981, Washington Post: A12. 27Congressional Record, House, 97th Cong., 2nd sess. (16 December 1981): 31812. 28Ward Sinclair, “Farm Bill Squeaks through House by 205 to 203,” 17 December 1981, Washington Post: A5. 29Congressional Record, House, 101st Cong., 2nd sess. (25 July 1990): 19216. 30Congressional Record, House, 101st Cong., 2nd sess. (24 July 1990): 18848. 31Terry Atlas, “Congress Vows Farm Drought Relief,” 23 June 1988, Chicago Tribune: 11. 32Wendy Zentz, “Democrats Praise Drought Relief Bill,” 13 August 1988, United Press International. 33Congressional Record, House, 99th Cong. 2nd sess. (9 October 1986): 30054–30055. 36Congressional Record, House, 103rd Cong., 2nd sess. (28 September 1994): 26293; CQ Almanac, 103rd Congress, 2nd Session, vol. L (Washington, D.C.: Congressional Quarterly, Inc., 1995): 191. 37Lisa Richwine, “De La Garza Announces Formation of ‘Ag for NAFTA’,” 26 July 1993, States News Service; Lisa Richwine, “De La Garza Helping Secure Last Votes for NAFTA,” 16 November 1993, States News Service. 38Congressional Record, House, 103rd Cong., 1st sess. (16 November 1993): 29209. 39Representative Harold Cooley of North Carolina chaired the Agriculture Committee for 16 years, from 1949 to 1953 and from 1955 to 1967. Biographical Directory of the United States Congress, “Harold Dunbar Cooley,” http://bioguide.congress.gov. 40“Major Cuts in Farm Bill Survive Test; House Panel Approves GOP Removal of Subsidies,” 21 September 1995, Dallas Morning News: 1D. 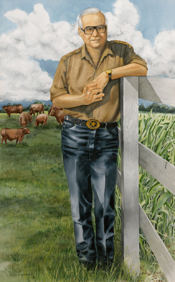 41Anne Hazard, “House Begins Historic Farm Bill Debate,” 28 February 1996, States News Service. 42All the entries for these bills proposing constitutional amendments can be found in the Congressional Record, Index, 89th–104th Cong. 43Lisa Richwine, “Ortiz, de la Garza Adjust to Life in the Minority Party,” 4 January 1995, States News Service. 44“Rep. de la Garza Won’t Run Again,” 18 December 1995, United Press International. 45Congressional Record, House, 104th Cong., 2nd sess. (28 February 1996): 3102. 46E. Kika de la Garza Fellowship Program, USDA, www.hsi.usda.gov, (accessed September 16, 2011); Rod Santa Ana III, “Former Congressman Honored for Lifetime Service to Agriculture,” The Monitor, www.themonitor.com (accessed 22 September 2011); Kika de la Garza Subtropical Agricultural Research Center, Weslaco, Texas, USDA, www.ars.usda.gov (accessed 24 October 2011). 47Eric Garcia, “Former Rep. Eligio ‘Kika’ de la Garza dies at 89,” 14 March 2017, Roll Call, http://www.rollcall.com/news/politics/former-rep-eligio-kika-de-la-garza-dies-at-89 (accessed 14 March 2017). Papers: 1965-1997, 656 linear feet. The papers of Eligio "Kika" de la Garza collection is arranged in chronological subgroups. Arrangement within each subgroup is generally as the items were received by the repository. Photographs: In the Fort Worth Star-Telegram Photographs, People, ca. 1861-1987, 81 linear feet. Persons represented include Eligio de la Garza. de la Garza, Kika. "Linking Trade Growth and the Environment: One Lawmaker's View." Environmental Law 23 (1993): 701-2. Ralph Nader Congress Project. Citizens Look at Congress: Eligio de la Garza, Democratic Representative from Texas. Washington, D. C.: Grossman Publishers, 1972. "Eligio 'Kika' de la Garza II" in Hispanic Americans in Congress, 1822-2012. Prepared under the direction of the Committee on House Administration by the Office of the Historian and the Office of the Clerk, U.S. House of Representatives. Washington: Government Printing Office, 2013. U.S. Congress. House of Representatives, Committee on Agriculture. The War We Must Not Lose: The War on Hunger. 99th Congress, 1st Session, 1985. Washington: Government Printing Office, 1985.